Note: Bookstores can order these titles through Ingram. There is good reading on the land. The records are written in forests, in fencerows, in bogs, in playgrounds, in pastures, in gardens, in canyons, in tree rings. Interpreting this reading matter, in place, on the land, seeing living things in their total environment, is an adventure into the field that is called ecology. See the world around you with fresh eyes, as you join naturalist May Theilgaard Watts on a field trip across America. She shows us how, if we take time to observe the world around us, and learn to interpret the clues we find, we can piece together a narrative–a story–of the forces that have formed and continue to change the landscapes we observe. Any place, if we look closely, can tell us many stories; of geology, of weather, of the community of interrelated plants and animals that have shaped it, of the history and culture of the people who have lived there. Reading the Landscape of America is a series of essays about places across the United States. Watts explains natural processes, such as plant succession and dune formation at the Indiana Dunes, or how plants adapt to cold and wind above timberline in the Rockies. She also considers how the plant life of a place reflects the history and values of the people who have lived there, as she considers the plants that grow in a schoolyard or in a suburban garden. She shows, with words and her charming illustrations, how cows shape hawthorns, how plants turn a lake into a bog, how an island moves downstream, and how a cemetery on the Illinois prairie becomes a last refuge for native plants. May Theilgaard Watts was the first to teach that the landscape is intelligible and that people can enrich their lives by learning to read it. A classic in landscape interpretation, remarkably timely. Unexcelled in the blending of landscape ecology and lived experience on landscapes. -Holmes Rolston, International Society for Environmental Ethics. Mrs. Watts has a valuable and original idea in considering the whole ecological interrelationships represented by each different landscape in turn. Her books should be helpful to everyone who wants to see more and understand more. The first edition of this book was published in 1957 as Reading the Landscape: an Adventure in Ecology. 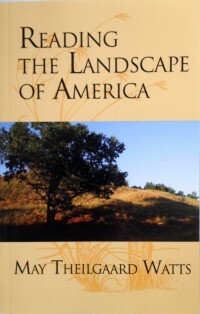 For the 1975 revised and expanded version, published as Reading the Landscape of America, the author added chapters about new locations, and revisited many of the places included in the first edition and commented on the changes she found. About the author: May Theilgaard Watts was a teacher, writer, naturalist, and conservationist. The daughter of Danish immigrants, she began her teaching career in one-room rural schools in the countryside around Chicago, Illinois. She earned her college degree taking summer classes at the University of Chicago. At Chicago, she studied with the pioneering American ecologist Henry C. Cowles, whose work she would later popularize. Watts was an award-winning poet, author of books and scholarly articles, and mother of four. She wrote a column about nature study for the Chicago Tribune, and hosted a television show on a Chicago station on the same topic. In addition to Reading the Landscape of America, May Watts’ works still in print include several Finders plant identification keys, originally created as handouts for her students, and Reading the Landscape of Europe.